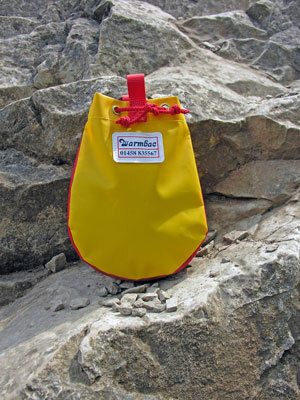 Warmbac Tackle Bags come in a range of sizes to meet the needs of every caver. They are designed from the outset with quality in mind and under go rigorous testing in the field before production. 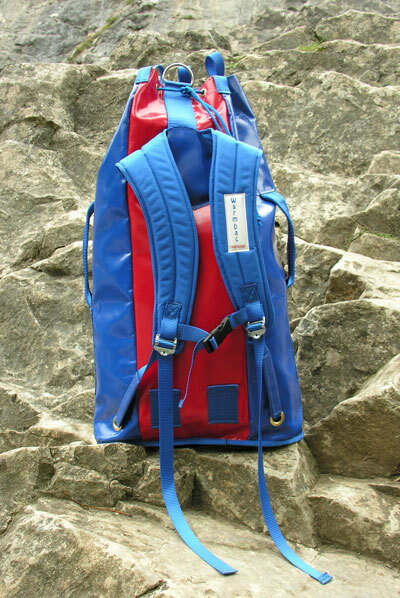 Whether you are looking for a small personal bag or a rope bag large enough for the deepest Alpine cave Warmbac has a tackle bag for you. Made from light weight PVC, with two loops & 10mm eyeleted drain hole. This is the perfect bag to carry all the personal small Items. Manufactured from heavy duty PVC, with cordura internal closure flap. 44mm webbing shoulder straps. Metal buckles are used to attach the lower straps. 25mm replaceable lower straps with a 12cm PVC protection sleeves at the base. 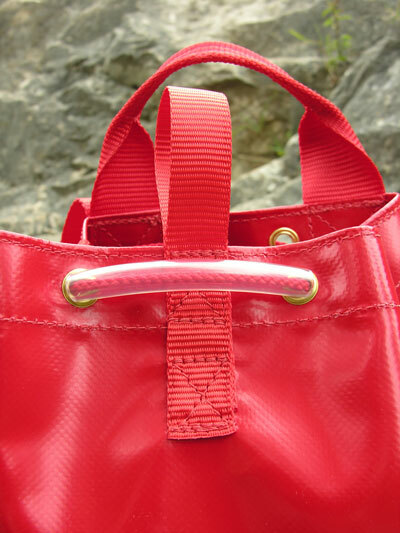 An internal rope attachment loop is also stitched to the straps. Handle/hauling loop is stitched from a single strip of 50mm webbing for extra strength. The handle has a 25mm webbing insert. The hauling loop has a 50mm stainless D ring. The rear hauling loop is 25mm webbing. Top of side seam is reinforced with webbing which also forms an internal loop. The base has a 25mm webbing drag handle and 2x15mm eyeleted drain holes. For extra protection, the lower part of the bag is double thickness pvc. Metal buckles are used to attach the lower straps. The base has a 25mm webbing drag handle and 3x15mm eyeleted drain holes. For extra protection, the lower part of the bag is double thickness pvc. To further protect the bottom of the bag, we stitch 25mm webbing around the base Packing the bag is made easier, by making the circumference at the top is larger than at the bottom. Manufactured from heavy duty PVC, also with an internal cordura pocket with velcro closure. 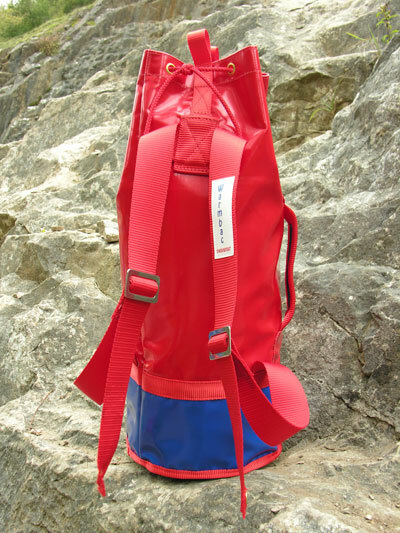 Both the shoulder straps & top handle/hauling loop are stitched from one piece of 44mm webbing. 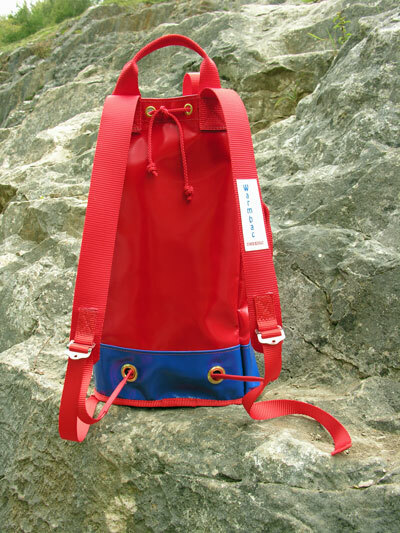 The shoulder straps have metal adjustable buckles to attach the lower 25mm straps. The 50mm side handle has a 25mm webbing insert. The rear 25mm hauling loop is double stitched for extra security when hauling. The oval base has a 25mm webbing drag handle and 2x15mm eyeleted drain holes. All webbing straps are stitched using the flag box method. The shoulder straps are cordura with padded inserts. Metal buckles are used to attach the lower straps. An internal rope attachment loop is also stitched to the straps. Handle/hauling loop is stitched from a single strip of 50mm webbing for extra strength a 50mm stainless D ring is fitted to the hauling loop. The rear hauling loop is 25mm webbing. There is also a 50mm side handle. Both Handles have a 25mm webbing insert, & are covered with pvc at the attachment points. Top of the side seam is reinforced with webbing which also forms an internal loop. For extra protection, the lower part of the bag is double thickness pvc. To further protect the bottom of the bag, we stitch 25mm webbing around the base. 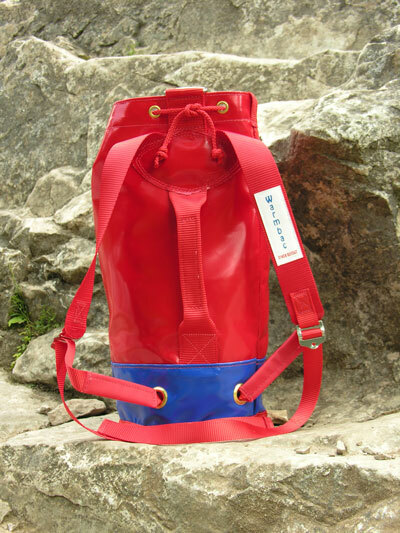 The Kidney shape base has 3x15mm eyeleted drain holes, a webbing drag handle is also fitted. 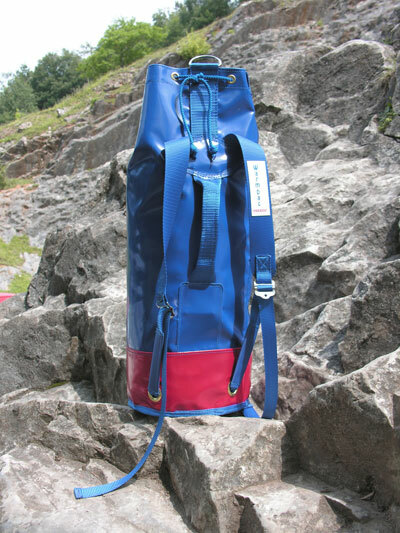 This is the ideal outdoor centre bag, for carrying small items of equipment to the activity site. Manufactured from heavy duty PVC, with cordura internal closure flap. Inside cordura pocket with velcro closure. A Sternum strap is also fitted. Two belt loops are also attached. 25mm replaceable lower straps with a 12cm PVC protection sleeves at the base. 50mm front hauling loop with a 50mm stainless D ring, plus 3 extra 25mm hauling loops, The 50mm side handle has a 25mm webbing insert. The attachment to the bag is reinforced with pvc patches. Top of one side seam is reinforced with webbing which also forms an internal loop. The kidney shape base is double thickness, with a 50mm webbing drag handle, & 3x15mm eyeleted drain holes, and To further protect the bottom, we stitched 25mm webbing is around the base. This cavers tackle bag has been designed in conjunction with members of the Daren Cilau digging team, to accommodate two daren drums, also with the extra features, to better withstand the rigors of the entrance crawl. 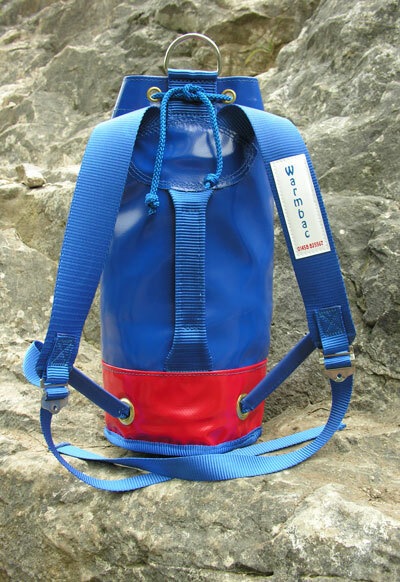 Manufactured from heavy duty PVC, with one 50mm side handle, 44mm shoulder straps with stainless steel adjustment buckles. 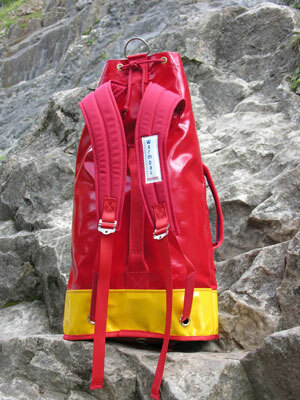 For extra protection, the lower part of the tackle bag is double thickness pvc. This material also protects the stitching for the lower shoulder straps. To further protect the bottom of the bag, we stitch 25mm webbing around the base. The base has a 25mm drag handle, and 3x15mm eyeleted drain holes.